UPDATE: I’m informed on Friday (August 24) that Digital Book World WILL begin adding authors’ names to its ebook listings in its new eBook Best-Seller List, starting Monday (August 27) with its second weekly release of the list. Glad to know that a whiff of our Ether here seems to have been inhaled. Here is our original post. Now, honey, you can find out more, just a little bit, about what ebooks mean to me and you with respect to the market, in a new and welcome ebook-only best-seller list from Digital Book World. What you won’t find out? –who the authors are. That’s #DBW to your tweetly neighbors, one of the verticals of F+W Media. And today, it’s inaugurating its interesting DBW eBook Best-Seller List, which keys into pricing as a way to evaluate what’s selling and for how much. $8-$9.99 *We see a Top 8 in this band in the early look I’m being given, not 10, and that’s because only eight ebooks from the $8-$9.99 group placed in the Top 100 ebook best-sellers, from which these breakouts are drawn. The list…aggregates the previous full week’s sales ranking data from Amazon, Nook, Google, Kobo and Sony…Price is a fundamental correlative to sales; reporting, tracking and analyzing pricing and its relationship to e-book sales is the primary objective of the weekly Digital Book World best-seller list. Each retailer (is) weighted by approximate market share as determined by the editors of Digital Book World and Iobyte Solutions. Good to see authors mentioned in Nussbaum’s comment, right? So it would be even better to see them listed with their works on the new DBW eBook Best-Seller List. That’s not happening, at least not in the advance copy of the debut list provided to the media. While the digital dynamic and its pricing upheavals are gathering enough weight to warrant this kind of specialized attention, ebooks appear to be writing themselves. The Miracle at DBW, of course, is easily remedied, and probably the result of an oversight as the industry! the industry! learns new patterns of recognition. The new list, with publishers properly attached to each entry, has much to commend it, and will be even more valuable when the inclusion of authors’ names brings it up alongside the author-inclusive lists of the New York Times, USA Today, the Los Angeles Times, GalleyCat in its self-published best-seller lists, and others. Meanwhile, there are useful points to note in this week’s initial outing. Got an email from a "fan" outraged that a novel I've been working on for two years, six days a week is $13 in ebook. Enjoy your $4 coffee. In the Top 25 overall list, you’ll find that four ebooks are listed as being sold for less than $3. At No. 11: Deep Down: A Jack Reacher Story sells for $1.99 (at Ether time). It’s by Lee Child. At No. 12: The Boy in the Suitcase sells for $1.39. It has two authors, Lene Kaaberbøl and Agnete Friis. At paidContent, Laura Hazard Owen just posted one of her fine Friday eBook Bestseller Breakdown analytical pieces on this one. Her article will help you understand how it has reached such success. ave You: A Novel, at Ether time shows a Kindle price of $12.99, although the DBW list sees it selling for $2.99. Those darned algorithms strike again. The author, at any price, is Jonathan Tropper. At No. 25: Black Order (Sigma Force, Book 3) is listed as selling at 99 cents. That agrees with the Kindle price we see listed at Ether time. As Berger’s prepared material also points out — the Top 25 list includes only four ebooks not published by Big Six houses. Those four are the three books in The Hunger Games series by Suzanne Collins, from Scholastic. And there’s Kaaberbøl and Friis’ The Boy in the Suitcase mentioned above, which is published by Soho Press. It appears the Fifty Shades of You Know What series by E.L James may be overtaken one ebook at a time. The first ebook of that trilogy stands at No. 4 in the Top 25 ranking. Gone Girl: A Novel by Gillian Flynn taking the No. 3 spot. Self-publishing enthusiasts may be concerned to note that only two self-published ebooks appear to figure into the various rankings in the first week’s outing for the DBW list. In the Top 10 breakout for ebooks selling at $0 to $2.99, Sarah’s Surrender by Lynda Chase is ranked No. 5 on this breakout scale (No. 26 on the main list). And Weekends Required by Sydney Landon is at No. 9 on this breakout (No. 30 on the main list). Bowker Market Research’s Kelly Gallagher. OMG, a positive article in The Guardian about Fifty Shades. Is the editor on holiday? Author E.L. James’ Fifty Shades ebooks, at Nos. 1, 2, and 4 on the inaugural list, are priced at $9.99. The real story in this first week’s release of the new list lies in the pricier ebooks. The Top 25 is dominated not only by ebooks published by major houses but also by price points on the upper end. I count 17 of the Top 25 selling at $9.99 or higher. Four more are priced between $5 and $7.99. These rankings won’t gladden the eyes of publishing community members who favor those ultra-low prices. But the value here is the data-based provision of this big picture by Iobyte Solutions. Even when the news isn’t what some want, clarity has its payoffs. Author Gillian Flynn’s Gone Girl, at No. 3 in this week’s debut ebook list, sells for $12.99. Those working in the self- and small-publishing fields of the industry may see new goals in the trends arrayed for us over weeks and months to come with the DBW list. Authors who are studying the best routes for their projects — often a “hybrid” mix of traditional and non-traditional publishing — might find new direction in genre, price points, and staying power on these lists. Whether the news is what you’d like it to be or something else, DBW has offered us a new tool, a new way to see how things are looking in the ebook market. And for that — while eagerly watching for those authors’ credits — we can certainly show some respect. What do you think? 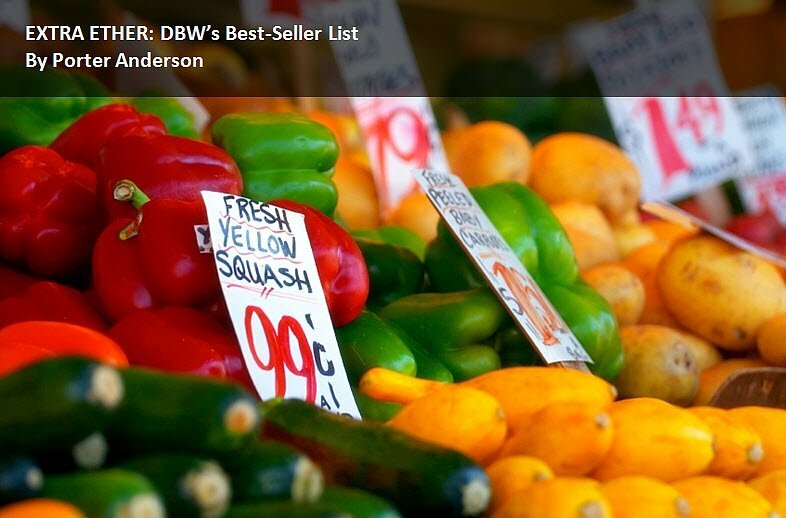 Is there value for you in the approach DBW’s new ebook best-seller list is taking? How would you account for the small number of low-priced ebooks in the Top 25? And how would you account for the overwhelming dominance of major houses’ ebooks on the list? Join us Thursdays at JaneFriedman.com for Writing on the Ether, presented this week by Ether sponsors Deirdre Gogarty and Darrelyn Saloom, authors of My Call to the Ring: A Memoir of a Girl Who Yearns to Box. For the record: I’m a member of DBW, I contribute to its Expert Publishing Blog, and I work with F+W Media to cover its major conferences. I agree with @brentweeks and have a problem with selling well-crafted books for change found under couch cushions. After a book has recovered the publisher and author’s investment and has made a profit, it makes sense to offer a great deal to create a buzz and send it soaring to the top of a bestseller list. I believe @BobTarte did this recently with his book Enslaved by Ducks. But a new release after years of hard work? Have mercy people. Authors need to eat. Wow, thank you for sharing this. It puts into perspective how the market is working these days. You bet, Marla, thanks for reading, and for dropping a note. In fact, the perspective may be surprising for some (the success of the upper-priced tiers, for example). We’re all learning, lol.